Tony Gwynn is known by most as one of the greatest hitters to ever play the game of baseball. It turns out that he was a pretty good basketball player back in the day as well. And now, thanks to Upper Deck's deal to produce NCAA-themed products, the baseball Hall of Famer has his first hoops cards in 2012-13 Fleer Retro Basketball. 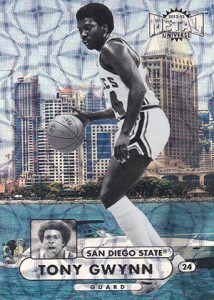 Gwynn went to San Diego State University as a basketball standout. 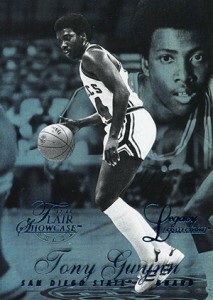 He played point guard for the Aztecs, setting school records for most assists in a game, season and career. It wasn't until his second year in college that he picked up a bat for SDSU. The rest is history. While Tony Gwynn didn't join the ranks of Bo Jackson as a two-sport professional, he did leave his mark in both sports. 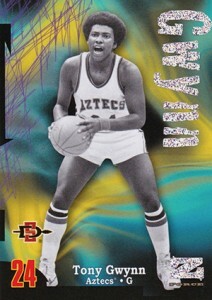 Including parallels, the San Diego Padres great has 13 cards in 2012-13 Fleer Retro Basketball. All are based on Fleer-branded basketball designs from the mid- to late-90s, one of the wildest and most creative era in the hobby's history. The Tony Gwynn basketball cards are almost like the reverse of one of the most famous cards of the early-90s, the 1991 Upper Deck Baseball Michael Jordan #SP1. It pictured Jordan taking batting practice with the Chicago White Sox. 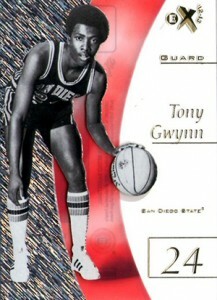 However, the 2012-13 Fleer Retro Basketball Tony Gwynn cards are much more rare. 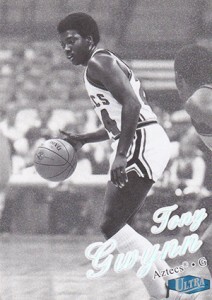 Below is a complete list of the 2012-13 Fleer Retro Tony Gwynn basketball cards. I happened to pull one of his Precious Metal Gems and Bill Russell Metal Gems from the same box.